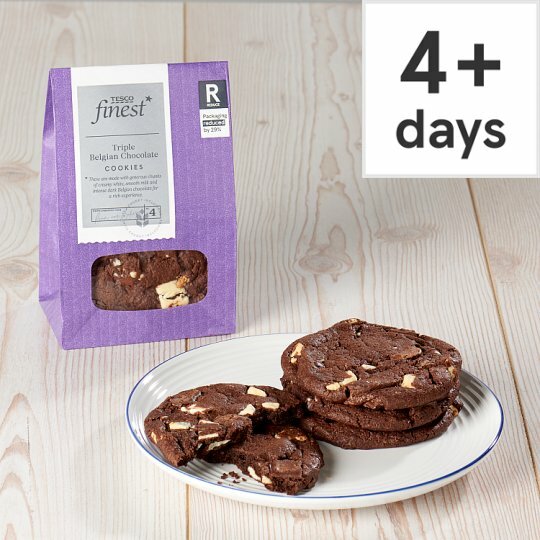 4 Soft and chewy chocolate cookies with Belgian white, milk and dark chocolate chunks. Soft, chewy and generously filled with chunks of milk, dark and white Belgian chocolate. INGREDIENTS: Wheat Flour (Wheat Flour, Calcium Carbonate, Iron, Niacin, Thiamin), Brown Sugar, Belgian White Chocolate Chunks (14%) (Sugar, Dried Whole Milk, Cocoa Butter, Emulsifier (Soya Lecithins), Flavouring), Belgian Milk Chocolate Chunks (13%) (Sugar, Dried Whole Milk, Cocoa Butter, Cocoa Mass, Emulsifier (Soya Lecithins), Flavouring), Butter (Milk), Palm Oil, Sugar, Cocoa Powder, Belgian Dark Chocolate Chunks (2.5%) (Sugar, Cocoa Mass, Cocoa Butter, Emulsifier (Soya Lecithins), Flavouring), Humectant (Glycerine), Rapeseed Oil, Raising Agents (Sodium Bicarbonate, Disodium Diphosphate, Calcium Dihydrogen Diphosphate), Glucose-Fructose Syrup, Whey Powder (Milk), Wheat Fibre, Invert Sugar, Flavouring.